A redacted government report on the shale gas industry's impact on rural economies should be published in full, Lancashire County Council has said. The Department for Environment, Food and Rural Affairs (Defra) report was released in July 2014 "with many words left out", a council spokesman said. Following a unanimous vote, the council will write to Defra, asking for the report to be published in full "in the interests of transparency". Defra said that was not possible. A spokeswoman for the department said while the redacted draft paper was online, the full report was "an internal document" which would not be published. Councillor Marcus Johnstone, who proposed the motion to ask for the Shale Gas Rural Economy Impacts report to be published in full, said it could be "a valuable source of information, but it was heavily redacted". "Many people have concerns about the potential development of a shale gas industry, including the availability of relevant information about how the industry might affect the community they live in. "The council will now formally ask the government to release the report in full, in the interests of transparency." Fellow councillor Gina Dowding, who seconded the motion, said "a large amount of information has been left out of the published version and it appears that the omissions include some significant details". 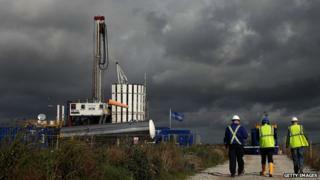 The council is due to decide whether to grant energy firm Cuadrilla planning permission to frack at two sites in Lancashire in April. Council planners recommended refusal in January, prompting Cuadrilla's successful request for a deferral until 30 April. Fracking - or hydraulic fracturing - is a technique in which water and chemicals are pumped into shale rock at high pressure to extract gas.